The Michigan Department of Health and Human Services (MDHHS), the Maternal Infant Strategy Group (MISG), the Maternal Infant Health and Equity Collaborative (MIHEC), and the Michigan Alliance for Innovation on Maternal Health (MI AIM), in partnership with national and local partners, invite you to a statewide conference. The primary goals of this conference are to create synergy and align priorities between public and private organizations, as well as provide educational opportunities that will allow members to keep abreast of the latest developments in the field. View the Meeting Program here. The Obstetrics Initiative was honored to be one of the “Cafe Conversations”. View presentation. Program Directors Daniel M. Morgan, MD and Lisa Kane Low, PhD CNM and Clinical Site Engagement Coordinator, Jill Brown, RN presenting on March 13th at the Obstetrics Initiative Cafe Conversation. Michigan Section of ACOG annual SNOW MEETING, February 2-3, 2018 View presentation. Maternal Infant Summit in Lansing, March 5, 2018. View presentation. 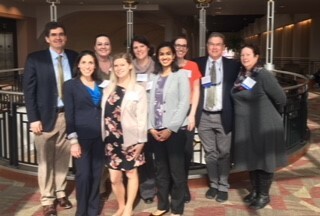 Obstetrics Initiative team members at the Maternal Infant Summit in Lansing, March 5, 2018.